The devices of the series Hydrocont® SN50 with integrated digital evaluation electronic are compact sensors for measuring and monitoring of fill levels. The excellent characteristics like highest strength against pressure and pressure blows, high resistance against chemicals and corrosion, very good insensitiveness against temperature shocks and EM interference, highest accuracy and long term stability and also low influence of temperature makes it possible to use the sensor in all pressureless containers for liquid medium like water, waste water, solvents, oil, sludge, grease, cleaning agents, etc. The level measurement system Hydrocont® SN50 is built in the wall of the medium container. The medium contacts directly the ceramic membrane of the sensor without using a pressure mediator liquid and causes there a deflection of the membrane because of the hydrostatic pressure of the medium. At the maximum deflection the membrane contacts a robust ceramic carrier and because of this, the membrane come through over pressure of e.g. 80-times of nominal load at a sensor with a pressure range of 0...50 mbar without damage. The fill level proportional pressure signal of the ceramic membrane is recorded from a processor with high resolution, adjusted according to the settings and converted into a high resolution output signal of 4...20mA or 0...10V. 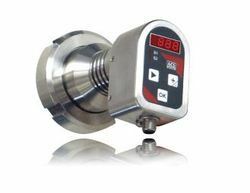 By using optical keys and an TFT-display the sensor measurement range, the display, the PNP-switching outputs and the damping can be adjusted or the behaviour in the case of failure and the release of the fast adjustment can be set. The switching state of the up to 4 PNP-switching output is signalled by the TFT-display. The devices of the series Hydrocont® D50 with integrated digital evaluation electronic are compact sensors for measuring and monitoring of fill levels. Because of the special construction of the device Hydrocont® D50, this sensor is especially suitable for the use in areas with high air humidity and condensed water formation, where conventional devices can not be used or can only be used by applying an expensive leaded pressure compensation capillary. The level measurement system Hydrocont® D50 is built in the wall of the medium container. At the maximum deflection the membrane contacts a robust ceramic carrier and because of this, the membrane come through over pressure of up to 80-times of nominal load without damage. The fill level proportional pressure signal of the ceramic membrane is recorded from a processor with high resolution, adjusted according to the settings and converted into a high resolution output signal of 4...20mA or 0...10V. Due to the integrated linearization function with up to 25 linearization points it is possible to realize a linearization of the measuring signal, e.g. for the volume calculation in conical or laying cylindrical container. By using 3 keys and an LED display the sensor measurement range, the display, the PNP-switching outputs and the damping can be adjusted or the behaviour in the case of failure and the release of the fast adjustment can be set. The switching state of the two PNP-switching output is signalled by one LED for every output. 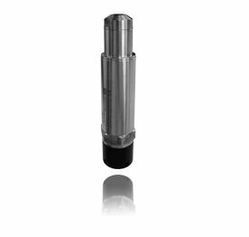 The device Hydrocont® K PEEK with integrated analogue transmitter electronic is a compact sensor for continuous measuring of fill levels in especially aggressive liquid media. Due to the use of especially high-quality materials like PEEK, aluminum-oxide-ceramic, PTFE and perfluorelastomere for the medium contacting parts of the device it is especially suitable for the use in e.g. iron-III-chloride, sulfuric acid, phosphoric acid, formic acid, citric acid etc. The excellent characteristics like highest strength against pressure and pressure blows, very good insensitiveness against temperature shocks and EM interference, highest accuracy and long term stability and also low influence of temperature makes it possible for use in all pressure-less containers. The level measurement system Hydrocont® K PEEK is built in the wall of the medium container. The fill level proportional pressure signal of the ceramic membrane is measured by the integrated analogue electronic and converted into a output current signal of 4...20mA according to the zero and end point settings of the user. The current signal can be influenced with an adjustable damping, e.g. to compensate wave movements due to mixing machines. With the Sonicont USN ACS -CONTROL -SYSTEM GmbH provides an ultrasonic sensor for continuous, non-contact level measurement of bulk solids and liquids. The Sonicont USN can be combined with up to 4 freely adjustable switching points and is suitable for measuring ranges from 2 to 8m. 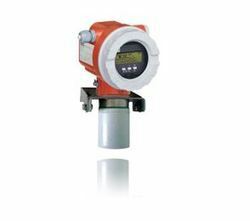 This sensor is suitable for a variety of measurement tasks and can be used in all container shapes - and this with an accuracy of ≤ 0.2% resp. 2 mm. Also the analog output 0 (4) ... 20 mA and 0 .. 10V is switchable. The modern transmitter has extensive diagnostic functions for system analysis and still allows easy setup and operation through the clear and easy navigation. The Soncicont USN is also able to detect flow rates and currents. The mathematical formulas for this are already stored in the device. Along with the closed, smooth user interface with optical keys the compact stainless steel case with rotatable display allows optimal usability in any position. The viewing angle optimized 2 " TFT color display ensures an excellent displaying of the measured values and easy readability. Intelligent data management is possible through the Bluetooth interface and a built-in data logger function to record measured values. Telecommunications: meets FCC requirements for "Uninternational Radiator"
CE-mark: Levelflex meets the legal requirements of the EC directives. The successful testing is computed by affixing the CE Mark. 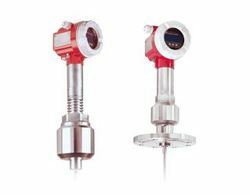 Compact hydrostatic level measurement,with dry, capacitive sensor. The device Hydrocont® LK with integrated analogue evaluation electronic is a compact hydrostatic transmitter for continuous measuring of filling levels in liquids at hydrostatic pressures from 0 up to 1 bar within pressure less container, at process temperatures from – 40°C to +100°C. The use of a capacitive measuring sensor with ceramic membrane, allows the use in nearly all fields of industry. Application fields are e.g. the measurement of levels in reservoirs, clarification basins, deep wells etc., but also the filling level measurement in closed containers at liquids, like e.g. water, waste water, solvents, oil, sludge, fat, cleaning liquids, etc. The device Hydrocont® LK is used for filling level measurement by measuring the hydrostatic pressure. The device can be alternatively used as put in sensor that is sunken down into the liquid by the carrying cable and a suitable fastening, e.g. cable clamp fixing or screw plug or also be screwed-in from outside into the container wall. Looking for Fill Level Technology ?